Mod The Sims - Caster - Create a Style for The Sims 4! NOW WITH DDS SUPPORT! Caster - Create a Style for The Sims 4! NOW WITH DDS SUPPORT! Replies: 53 (Who? ), Viewed: 30085 times. #1 2nd Aug 2014 at 3:27 AM Last edited by Zerbu : 3rd Aug 2014 at 2:40 AM. 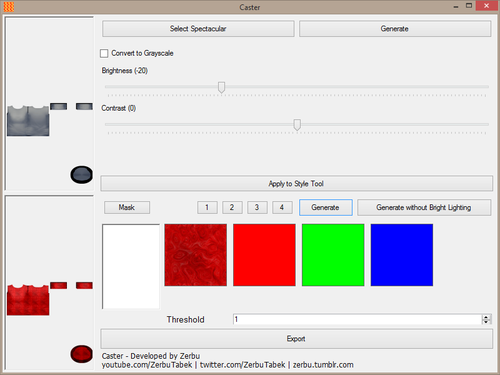 Caster is an image editing tool allowing players of The Sims 4 (and of course, the Create a Sim demo) to quickly and easily create patterns and recolours for CAS parts and - hopefully in the future - build mode objects. 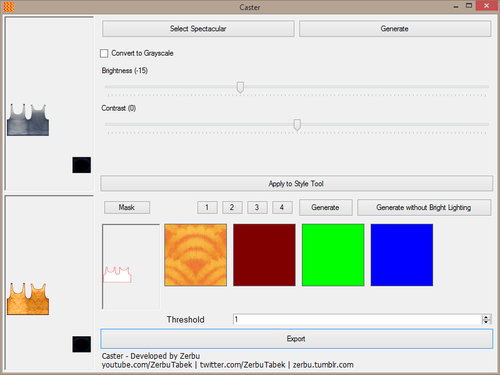 Caster is based on the Create a Style tool for The Sims 3. You just input a PNG or BMP version of a specular file, select a pattern, and you’re ready to go! You can also adjust brightness, contrast and threshold settings, as well as convert non-grayscale speculars to grayscale. You can set patterns using either the “1, 2, 3, 4” buttons, or by clicking on the pattern. If you want to use a solid colour, you can quickly generate one by right clicking. PLEASE NOTE: Caster only edits images, it does not read or write .package files. You will still need S4PE and CAS Recolor Tool to export and import files. Maybe a future version of the program will be able to read .package files, but the current one can’t. By default, the program will create the whole image using one pattern, but this can be changed using a mask of the same size as the specular. The program reads the mask, and determines based on the colours which design to use in which area. In order to work, the area of the mask must be one of the above solid colours - variations of them (example: darker red) will not work. The program uses an algorithm that draws the entire image pixel-by-pixel using the specular, mask and patterns/colours as instructions. The resulting image will be the tiled design(s), but will retain light and dark spots from the original specular. The brightness will be determined by the highest colour value (for example, if the pixel of the specular is R100, G200, B100, the brightness will be based on the green value). A value of 128 will have no brightness effect. Anything above or below that will be lighter or darker. This is more efficient than using a regular image editing program, and it actually redraws the image rather than just filling over it. REMINDER: Caster does not read or write .package files, you will still need S4PE and CAS Recolor Tool for that. Specifically, it uses the version stored with S4PE. I'm not sure if that was modified from the original or not. Good job Zerbu! Seen it on Twitter and thanks for the notice here. I need to start getting into recolors again, hope I can get this old brain into gear. This is brilliant. This will make it easier to recolour on the fly. 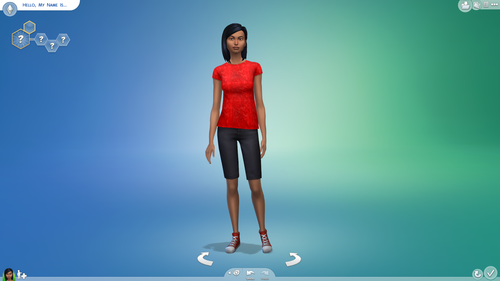 Would this be useful to recolor clothing for the sims 2 since it edits images, not DDS files? I know I would have to convert the bitmap textures to PNG for it to work if it did but it would be awesome if it were cross-game compatible like that. @)->----- Place this ASCII flower in your sig as a thank you to all of our amazing moderators at MTS! It might be possible I haven't tested it though, but if the process for recolouring in The Sims 2 is the same as The Sims 4, then it should work. Also, if the files are in bitmap then you shouldn't need to convert them. It supports any file format that Visual Studio supports. DDS is a special kind of image so that can't be supported without extra coding. Has the moding/CC community ever put so much effort in a game before it was even launched? Impressed! Has a game ever needed so much input from the CC community before it was launched? . Awesome job with this. CASt was a big deal for me in TS3 I used the heck out of it. 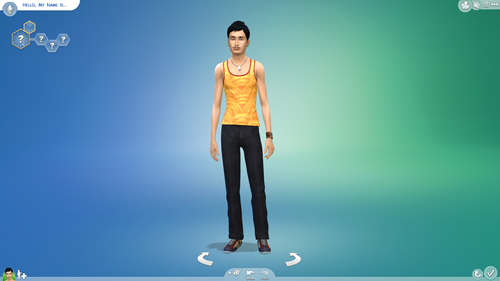 I have the CAS Demo for TS4 and I'm just not thrilled with how limiting the clothing options are imo. It only sets off my OCD and makes it darn frustrating to actually enjoy the game. That's so cool! I just hope it will be just as easy to adjust items in the actual game as it is to do it for the CAS demo. Wow! Thank you Zerbu! Can you make a similar tool to make new colors for hair? (E.g. add a purple hair color) Is that possible? The program has been released!! I'm about to edit the OP with details. I'm not sure that needs a tool, since it's just a simple recolour. It would probably be complicated to make though, since there's no way of automatically determining which pixels are which parts of the hair, unlike with spectacular images where all it does is detect how light or dark each pixel is. I do not have the words to express how much I love this. Marvelous job! Silly me, but does this allow you to recolor the items in CAS demo or outside of it? Scuse me if I'm being silly, but is it possible to recolor anything according to the HEX color picker with this, or will that be the next version hint* ? Yeah it works with the CAS demo! And it should work with the full release as well, unless they suddenly switched file formats which is extremely unlikely. You can recolour an image using solid colours if that's what you mean. Just right click on the pattern/colour and it will give you the option to generate a solid one. "Spectacular" has been changed to "Specular" - I feel really dumb for that mistake. I'll update the screenshots in not long. The program will now remember directories individually for speculars, masks and patterns, so it's more convenient to have the files stored in different places.